Creating devices smaller than 100 nanometers opens many doors for the development of new ways to capture, store, and transfer energy. Benefits already observed from the design of these products are an increased efficiency of lighting and heating, increased electrical storage capacity, and a decrease in the amount of pollution from the use of energy. IBM set a new world record for solar cell efficiency in 2010. The world record is for solar cells composed of copper, tin, zinc, sulfur, selenium, or similar materials. The new record is about 40% better than the previous best for solar cells using such materials. The efficiency rate of IBM’s new technology is 9.6%. The previous best was 6.7%. According to IBM, the only other solar cells that can boast an efficiency rate of 9 to 11% are made of extremely costly indium gallium selenide or cadmium telluride. The image above is of the first commercial flexible lightweight cell produced by G24 Innovation on a large scale for use as telephone chargers, G24 has been the first to realize large-scale, role to role production of lightweight flexible cells, which are sold presently on the market for mobile telephone charging. G24 said the module (pictured above) generates electricity both indoors and out to recharge devices such as mobile phones, cameras and portable LED lights. It is produced using a “roll-to-roll” manufacturing process. This was brought out in 2009. Even more innovative; researchers at New Jersey Institute of Technology (NJIT) have developed an inexpensive solar cell that can be painted or printed on flexible plastic sheets. “The process is simple,” said lead researcher and author Somenath Mitra, PhD, professor and acting chair of NJIT’s Department of Chemistry and Environmental Sciences. 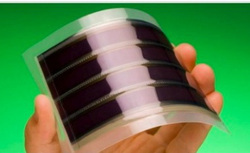 “Someday homeowners will even be able to print sheets of these solar cells with inexpensive home-based inkjet printers. Consumers can then slap the finished product on a wall, roof or billboard to create their own power stations.” Application of this DSC (Dye Sensitive Cell) in building integrated PV has already started and will become a fertile field of future commercial development. Global Photonic Energy Corporation says that you can use a spray painting method to paint their solar cells onto a car or other places that use spray paint, such as cell phone cases. The paint can come in virtually any color. They want to license their PowerPaint solar cells to manufacturers, but so far, they haven’t announced which car manufacturer will be the first to use it. The rate at which developments are occurring in the field of solar cells and solar power is becoming increasingly expeditious. Every week there seems to be new developments and improvements in the world of solar cells. Watch this space for updates. Small fuel cells are being developed which lend themselves to eliminating the use of batteries in PDAs and other handheld devices such as laptops. Companies are calling them direct methanol fuel cells (DMFCs) as methanol is the fuel of choice. DMFCs last longer than conventional batteries and can be plugged in and out in order of required usage, which means no more plugging in of devices to electrical outlets. In 2007, Angela Belcher of MIT developed a new battery using an environmentally harmless virus, demonstrating that biotechnology and nanotechnology will become closely intertwined. Nanosensors and semi-conductor nanostructures can play an important role in developing smart materials that can simultaneoulsy sense and destroy contaminants from the environment (Kamat and Meisel, 2003). With these degradation becomes operational only when contaminants are sensed. - Cerium oxide nanoparticles can be used as additive in diesel and diesel-biodiesel-ethanol blend to improve complete combustion of the fuel and reduce the exhaust emissions significantly . - Nanoparticles in paint technology offer the possibility of thinner, and therefore lighter, coatings, which could reduce, for example, the weight of aircraft, increase fuel efficiency and so reduce carbon dioxide emissions. - Advanced filtration may enable more water recycling and desalination, which enable more energy-efficient water purification (Miyaki et al. , 2000) .